There is one thing about an open-air rock concert on a cold, rainy day - it separates the sun and fun-seekers from the hard-core devotees. 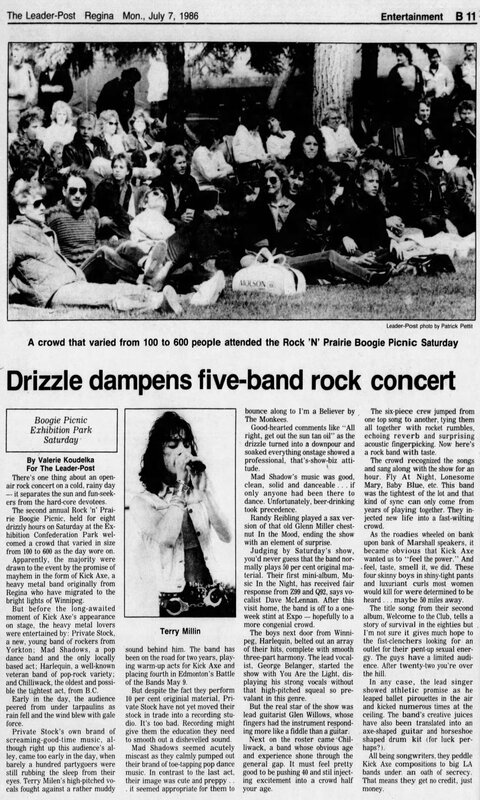 The second annual Rock'n'Prairie Boogie Picnic, held for eight drizzly hours on Saturday at the Exhibition Confederation Park welcomed a crowd that varied in size from 100 to 600 as the day wore on. Apparently, the majority were drawn to the event by the promise oy mayhem in the form of Kick Axe, a heavy metal band originally from Regina who have migrated to the bright lights of Winnipeg. But before the long awaited moment of Kick Axe's appearance on stage, the heavy metal lovers were entertained by: Private Stock, a new, young band of rockers from Yorkton; Mad Shadows, a pop dance band and the only locally based act; Harlequin, a well-known veteran band of pop-rock variety; and Chilliwack, the oldest and possible the tightest act, from B.C. Early in the day, the audience peered from under tarpaulins as rain fell and the wind blew with gale force. Private Stock's own brand of screaming-good-time music, although right up this audience's alley, came too early in the day, when barely a hundred partygoers were still rubbing the sleep from their eyes. Terry Milen's high-pitched vocals fought against a rather muddy sound behind him. The band has been on the road for two years, playing warm-up acts for Kick Axe and placing fourth in Edmonton's Batlle of the Bands May 9. But despite the fact they perform 10 percent original material, Private Stock have not yet moved their stock in trade into a recording studio. It's too bad. Recording might give them the education they need to smooth out a dishevelled sound. Mad Shadows seemed acutely miscast as they calmly pumped out their brand of toe-tapping pop dance music. In contrast to the last act, their image was cute and preppy ... it seemed appropriate for them to bounce along to I'm a Believer by The Monkees. Good-hearted comments like "All right, get out the suntan oil" as the drizzle turned into a downpour and soaked everything onstage showed a professional, that's-show-biz attitude. Mad Shadow's music was good, clean, solid, and danceable ... if only anyone had been there to dance. Unfortunately, beer-drinking took precedence. Randy Reibling played a sax version of that old Glen Miller chestnut In the Mood, ending the show with an element of surprise. Judging by Saturday's show, you'd never guess that the band normally plays 50 per cent original material. Their first mini-album, Music In The Night, has received fair response from Z99 and Q92, says vocalist Dave McLennan. After this visit home, the band is off to a one-week stint at Expo - hopefully to a more congenial crowd. The boys next door from Winnipeg, Harlequin, belted out an array of their hits, complete with smooth three-part harmony. The lead vocalist, George Belanger, started the show with You Are the Light, displaying his strong vocals without that high-pitched squeal so prevalant in this genre. But the real star of the show was lead guitarist Glen Willows, whose fingers had the instrument responding more like a fiddle than a guitar. Next on the roster came Chilliwack, a band whose obvious age and experience shone through the general gap. It must feel pretty good to be pushing 40 and still injecting excitement into a crowd half your age. The six-piece crew jumped from one top song to another, tying them all together with rocket rumbles, echoing reverb and surprising acoustic fingerpicking. Now here's a rock band with taste. The crowd recognized the songs and sang along with the show for an hour. Fly At Night, Lonesome Mary, Baby Blue, etc. This band was the tightest of the lot and that kind of sync can only come from years of playing together. They injected new life into a fast-wilting crowd. As the roadies wheeled on bank upon bank of Marshall speakers, it became obvious that Kick Axe wanted us to "feel the power". And feel, taste, smell it, we did. These four skinny boys in shiny-tight pants and luxuriant curls most women would kill for were determined to be heard ... maybe 50 miles away. The title song from their second album, Welcome to the Club, tells a story of survival in the eighties but I'm not sure it gives much hope to the fist-clenchers looking for an outlet for their pent-up sexual energy. The guys have a limited audience. After twenty-two you're over the hill. In any case, the lead singer showed athletic promise as he leaped ballet pirouettes in the air and kicked numerous times at the ceiling. The band's creative juices have also been translated into an axe-shaped guitar and horseshoe shaped drum kit (for luck, perhaps?). All being songwriters, they peddle Kick Axe compositions to big LA bands under an oath of secrecy. That means they get no credit, just money.